Karen Azenberg IS New York City theatre, and now she’s here in Utah in her new role as the Artistic Director of the Pioneer Theater Company at the University of Utah. We chat with her about her career, the infamous musical Spider-Man: Turn Off The Dark, and finally find out, is it ”theater” or “theatre”. 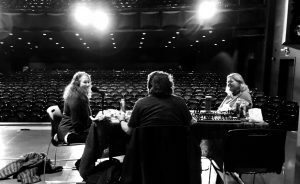 This entry was posted in Podcast Episodes and tagged Art, Bill Allred, Karen Azenberg, Pioneer Theatre Company, Salt Lake City, The Arts, Theater, Theatre, Utah. Bookmark the permalink. ← The Vanocur Group Special Episode!